Healthies of Hillsdale is not a juice bar. It’s not a Smoothie King. It’s not a place to get green drinks or smoothie bowls. It’s a place to get meal-replacement protein shakes. There’s a certain process cus­tomers follow when going to Healthies. First, they take a free shot of aloe water — flavor options include mango, man­darin, and cran­berry — which is sup­posed to aid digestion. Next, cus­tomers can select between several vari­eties of tea, hot or cold, to drink while waiting for a smoothie, or to take with them. Cus­tomers can opt to only get the 20-ounce shake, and no tea, for $1 less than the normal price. Cus­tomers finish the trans­action when employees hand out the shakes with a smile, and send the cus­tomer to the reg­ister, where the cost for the whole expe­rience is only $6.50. In addition to smoothies, Healthies serves drinks called “tea bombs,” which contain some caf­feine for an energy boost. They also serve a protein coffee, a filling drink made from a coffee and protein drink mix. 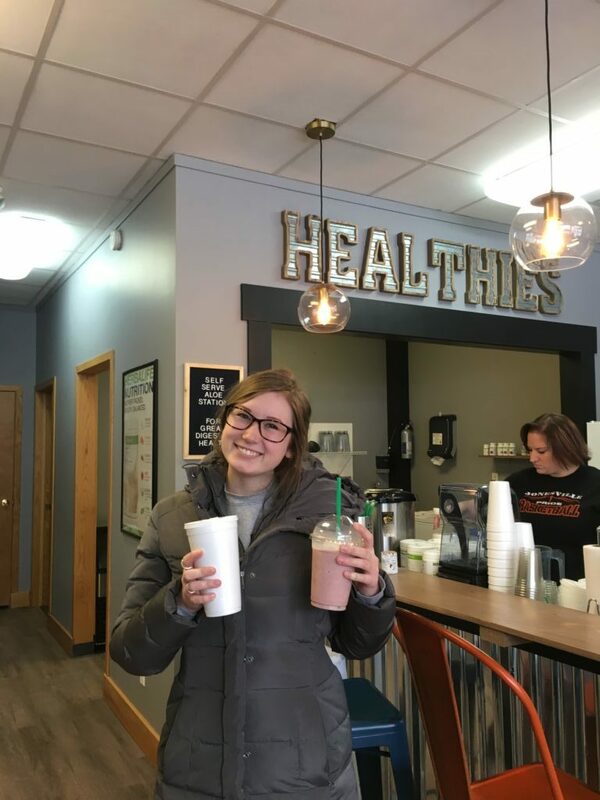 Healthies is a great place to go with friends, the process of going through the three steps and picking from among their 100 shake flavors is fun. Employees make it clear that if you have some­thing par­ticular in mind, they can probably make that for you, too, with their extensive ingre­dient options. The Straw­berry Cheesecake and Straw­berry Shortcake flavors, however, are the perfect middle ground between tasting like a smoothie and tasting like a milk­shake. They are fruity and fresh: a good blend of flavors, and not too sweet. Likewise, the Apple Pie shake tastes like a real apple pie, in smoothie form. The apple pie spices and the optional addition of oatmeal com­pli­mented the apple flavor: a match made in heaven. Made with the Herbalife protein line, the protein shakes fill you up but don’t weigh you down, and would be great for an athlete or any one else who wants a new way to fuel up after a workout. 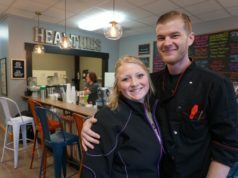 Healthies is a nice meal replacement option for stu­dents who may be tired of going to the cafe­teria or getting fast food. It stands out among the coffee and lunch shops in the area as a healthier, more inter­esting alter­native. Located on 77 N. Broad St., the shop is con­ve­niently located near campus. It is warm and com­fortable: when you step inside you might forget the cold weather on the other side of the door. Some stu­dents even said they may use it as a new study location. “I thought that it had a very nice atmos­phere and would be a place I would like to study,” freshman Emily De Long stated. And for those who do not want a cold shake on a cold day, Healthies even offers some warm shake flavors, such as coffee or hot chocolate. The employees are friendly and per­sonable. “I want people to be happy when they come in,” Steward said. This coming weekend, Feb. 1 – 3, Healthies will extend its weekend hours from 7 a.m. to 7 p.m. for their grand opening, at which they will have deals, raffles, and give­aways.